Click on any images on this page to see a bigger version of them. 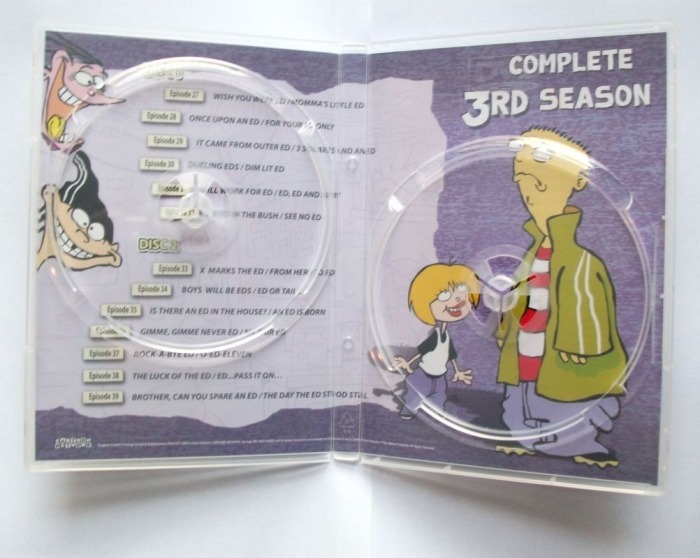 We all want seasons 3 to 5 of Ed, Edd n Eddy on DVD in America don't we? Well for now, those DVDs have been released in Thailand (who's DVDs are region 3). This page is a review on the season 3 DVD available there. Just to say, the Thailand sets are published by "MVD Company Limited", so I'm guessing they're not made in cooperation with Cartoon Network, so this is probably the reason they exist! The outside of the case has nice clip art pictures of The Eds on it, but nothing new, but that's because the DVD wasn't made with AKA Cartoon's help, obviously. It's all nice and clear though, although I have no idea what the description on the back says, but at least the names of episodes are in their original English. The case also tells you the specifications of the DVD, but I'll talk about them later. 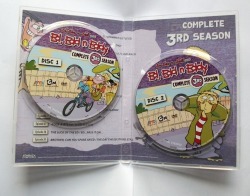 Although the case has lost the "cardboard" look of the season 1 and 2 DVD cases (that were also released in Thailand/R3, with the same cases as everywhere else) but the look is similar, for example the CN logo at the bottom right of the front and the frames of the images on the back are the same frames use on the season 1 and 2 DVDs. The side of the case is modelled to look like the season 1 and 2 DVDs, but the image at the top is clip art instead of something original. 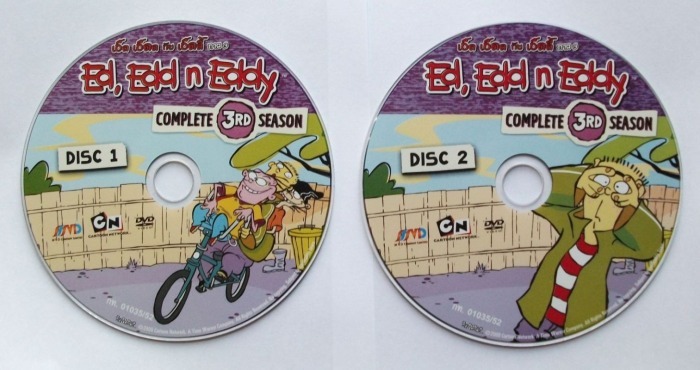 "Ed, Edd n Eddy" is also in red, compared to the season 1 and 2 DVDs which have white text for that. Inside of the case are the 2 discs (duh!) but instead of one being on the case and the other being on another swing tray, they're both on the actual case, one on the left side and the other on the right. I actually prefer it this way because there's less moveable parts to break! Also on the inside, they've included some more nice clipart (some are used to make Ed look like a scared giant!) and a list of the episodes again, repeated from the back of the case. No episode descriptions like on the American season 1 and 2 DVDs though, which is a shame. They'd probably be in Thai anyway, which wouldn't be much use to me. I like it being on the slip cover though instead of being a seperate leafter because it's less to lose. The discs are also nice, with the clipart on them, they sort of look like the American season 1 and 2 ones but not so much. Overall, I think the case is very well put together. It doesn't feel like they've used cheap materials and it does seem pretty professional. The general theme of this season 3 set seems to be purple, but that doesn't carry over to the DVD menus, which I'll mention later. Audio: Includes English/Thai tracks. The case states that the audio is 5.1, but it's only 2 (stereo) and I can't actually hear anything on the English soundtrack that makes it 2, so it might even be 1 (mono)! Still, it all sounds nice and clear. I haven't listened to much of the Thai audio track, but it seems to sound alright as well...I guess. The DVD defaults to Thai so you'll have to change it to English one way or another. Video: Looks very clear and nice, nothing to complain about in this department really! Subtitles/Closed Captions: Includes English/Thai ones. The English ones seem pretty accurate, obviously I'm not sure of the Thai ones, but I'm guessing they're alright. They don't include what sound effects happen from what I can see though. Nothing more to say really. No subtitles/closed captions are enabled by default so you'll have to enable them some way or another. Region Coding: Although the back of the packet states it's region 3 (and I've been reffering to it as region 3), it seems that it will work for all regions, so you don't need a DVD that can do multiple regions (multiregion), although you'll need a display that can handle PAL signals. The DVD itself, once inserted, displays some logos and messages and then if left, will start to play back all the episodes on that disc with Thai audio (and I think they call this mode EasyDVD). If you actually select the other option, you can go to the main menu which lets you change audio and subtitle/closed caption settings (these settings can also be changed while watching the show), select an "episode" or play them all back in a row. The main menu has some nice animated clip art on it, and so do the other menus, come to think of it! The menus are in both English and Thai so it's still easy to navigate. The episode selection screen doesn't have the names of the episodes on though, which is a let down, but the "episode" numbers, which you can then look at the case and find the right "episode". The episode selection has animated thumbnails, which is nice. All the menus have the theme tune playing in the background. Another annoying thing is that each "episode" doesn't have chapters to seperate the actual episodes in them, like the American season 1 and 2 DVDs did, so to get to the second actual episode, you're gonna have to forward through the first somehow. Besides this, everything's good. The menus have the "cardboard" look that the American season 1 and 2 DVDs have, so that's good, but too bad it wasn't used on the covers too. This DVD set is actually pretty decent for something that's not official. No extras though, but I wouldn't expect them for a DVD that wasn't released in America, when it's of an American show. All the correct episodes are on it. 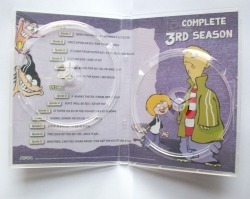 If you're a fan of the show who really wants season 3 on DVD, I suggest tracking it down and buying it; eBay is probably the best place to look. Do it. NOW! ...Potatoes wouldn't aid us in any way Ed.